Mid Century inspired kitchen & utility. 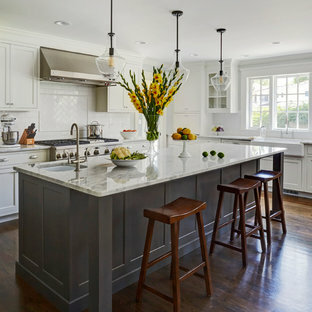 This creative transitional space was transformed from a very dated layout that did not function well for our homeowners - who enjoy cooking for both their family and friends. They found themselves cooking on a 30" by 36" tiny island in an area that had much more potential. A completely new floor plan was in order. An unnecessary hallway was removed to create additional space and a new traffic pattern. New doorways were created for access from the garage and to the laundry. Just a couple of highlights in this all Thermador appliance professional kitchen are the 10 ft island with two dishwashers (also note the heated tile area on the functional side of the island), double floor to ceiling pull-out pantries flanking the refrigerator, stylish soffited area at the range complete with burnished steel, niches and shelving for storage. 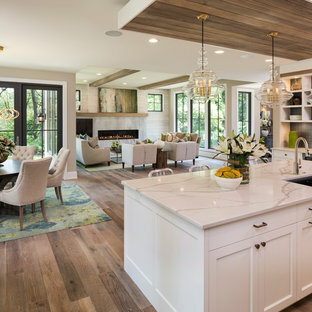 Contemporary organic pendants add another unique texture to this beautiful, welcoming, one of a kind kitchen! Photos by David Cobb Photography. Set upon an oversized and highly sought-after creekside lot in Brentwood, this ​two story home and full guest home exude a casual, contemporary farmhouse style and vibe. The main residence boasts 5 bedrooms and 5.5 bathrooms, each ensuite with thoughtful touches that accentuate the home’s overall classic finishes. The master retreat opens to a large balcony overlooking the yard accented by mature bamboo and palms. Other features of the main house include European white oak floors, recessed lighting, built in speaker system, attached 2-car garage and a laundry room with 2 sets of state-of-the-art Samsung washers and dryers. The bedroom suite on the first floor enjoys its own entrance, making it ideal for guests. 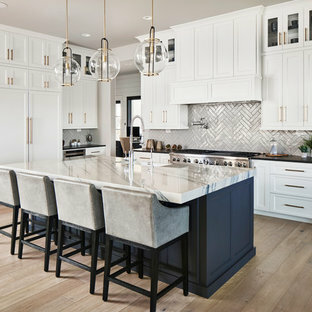 The open concept kitchen features Calacatta marble countertops, Wolf appliances, wine storage, dual sinks and dishwashers and a walk-in butler’s pantry. The loggia is accessed via La Cantina bi-fold doors that fully open for year-round alfresco dining on the terrace, complete with an outdoor fireplace. The wonderfully imagined yard contains a sparkling pool and spa and a crisp green lawn and lovely deck and patio areas. Step down further to find the detached guest home, which was recognized with a Decade Honor Award by the Los Angeles Chapter of the AIA in 2006, and, in fact, was a frequent haunt of Frank Gehry who inspired its cubist design. The guest house has a bedroom and bathroom, living area, a newly updated kitchen and is surrounded by lush landscaping that maximizes its creekside setting, creating a truly serene oasis. 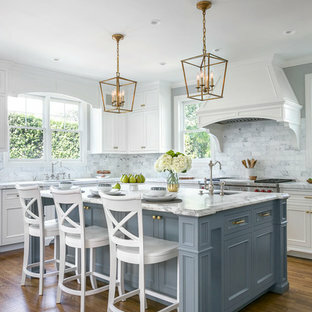 White kitchen with stacked wall cabinets, custom range hood, and large island with plenty of seating. The walkway that we closed up in the kitchen is now home to the new stainless steel oven and matching hood vent. Previously, the oven sat on the reverse side of the kitchen which did not allow for an overhead vent. 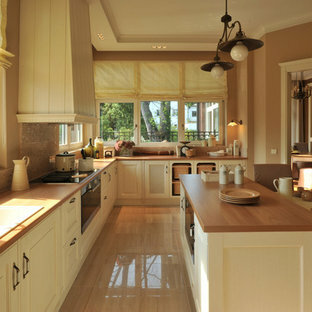 Our clients will certainly notice a difference in cooking now that the space is properly ventilated! 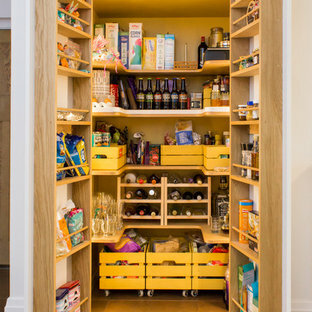 The new wall also allows for additional cabinet storage. 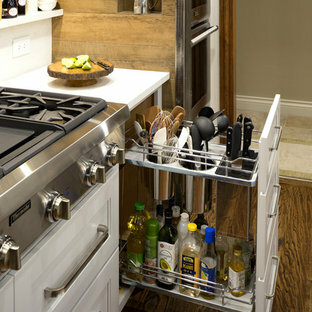 A space-saving Lazy Suzan sits in the lower cabinets to the left of the oven, while a stack of wide utensil drawers conveniently occupies the right side. Final photos by Impressia Photography.